I don’t know about you, but I was desperate to get my Christmas decs down pretty much as soon as December was over. For some reason they just look messy once Christmas Day is done – don’t you think? However, since losing the tree I am feeling like my house is seriously lacking in something, and I’m pretty sure that something is greenery! So it’s really quite fitting that Pantone chose this very shade as their 2017 Colour of the Year. What a great excuse to add some green back into our lives and get us ready for Spring. 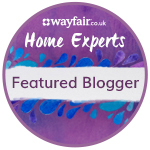 I’ve teamed up with Wayfair to show you the best ways of adding this trend into your homes. We’ve battled with the decision on whether to update the bathroom for the last two years. There’s nothing actually wrong with it, in that it’s less than 5 years old and everything works, in fact it was the most recently decorated room in the house when we moved in. But frustratingly, it’s just not to our taste…at all! However, we’ve found it hard to justify spending the money to re-do it simply because we don’t like it. However, now that we have a little one on the way I can’t help but feel that it’s now or never. I can’t see us finding the time (or the money!) after the baby is born and so we’ve just decided to go for it! We are up against it time wise though! I am due at the end of March and really don’t fancy bringing home our new little bundle of joy while we’re in the middle of some major DIY work – so I’m really hoping we can get it done in good time before the bubba arrives.